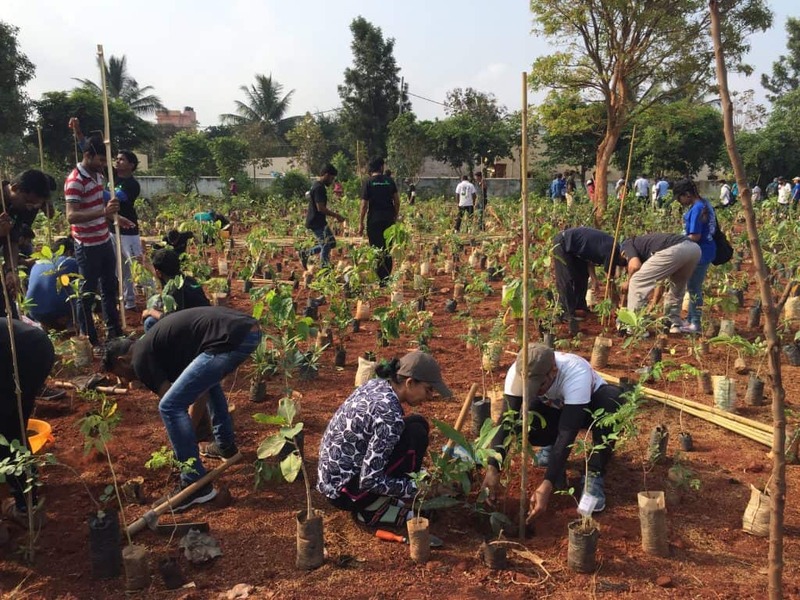 On April 22nd, World Earth Day, around 400 volunteers gathered at a Government High School near Bommasandra in Bengaluru, to plant 5500 saplings that will result in a forest by 2028. This Earth Day plantation drive was organised by Say Trees, a Bengaluru-based NGO that’s actively involved in tree plantations in India. This was their 8th plantation drive using the Miyawaki method of creating a forest, introduced by Akira Miyawaki, a Japanese Botanist. This method includes planting a variety of native species close together in a small pit. The advantage: trees grow 10 times faster and 30 times denser. The objective is to grow a 100-year-old forest in 10 years. At 7.45 am I walked into the Government School to find organisers arranging the equipment and saplings. Saplings were placed closely in strategic positions where no two varieties were kept adjacent to one another, to avoid too much density in one area. Soon after, volunteers along with families and children, arrived. We were then briefed on the Miyawaki method of creating a forest and a demonstration on how to plant a sapling. It was 8.15 am. We then formed groups of two to three individuals, and started planting. The forest pit had been prepared by Say Trees members 10-15 days prior to the plantation drive where they dug the ground 1 feet deep, added manure and cow dung to enhance microbial activity. To plant every sapling, we first dig the earth to the height of the sapling bed. Remove sapling from plastic/ cement bag. 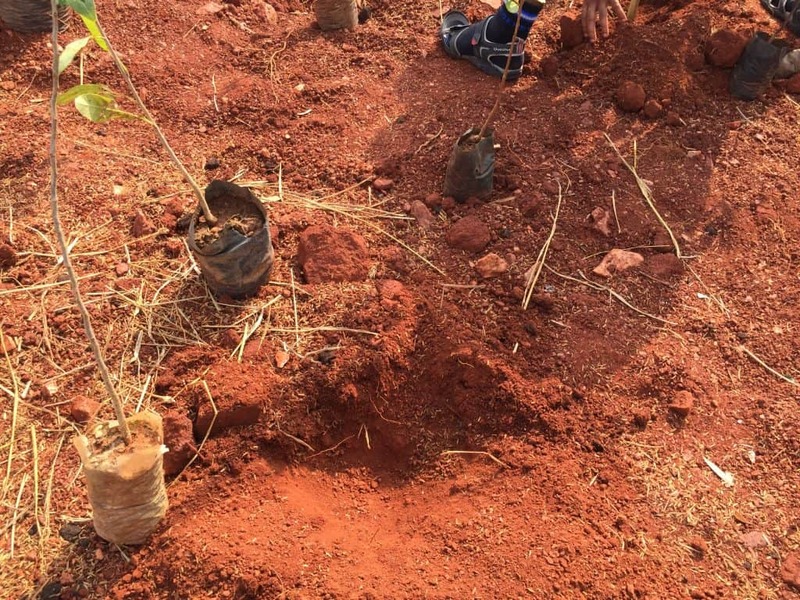 Then place it carefully in the dug out pit taking care to keep the soil around the sapling intact, as it has been growing in it for a few months and is accustomed to that soil. Add a handful of manure in the pit around the sapling. Fix a stick next to the bed of the sapling and tie it to the sapling. This gives the sapling support as it grows. Then cover the sapling with the dug out soil and press it to keep it firm. One sapling is now successfully planted! 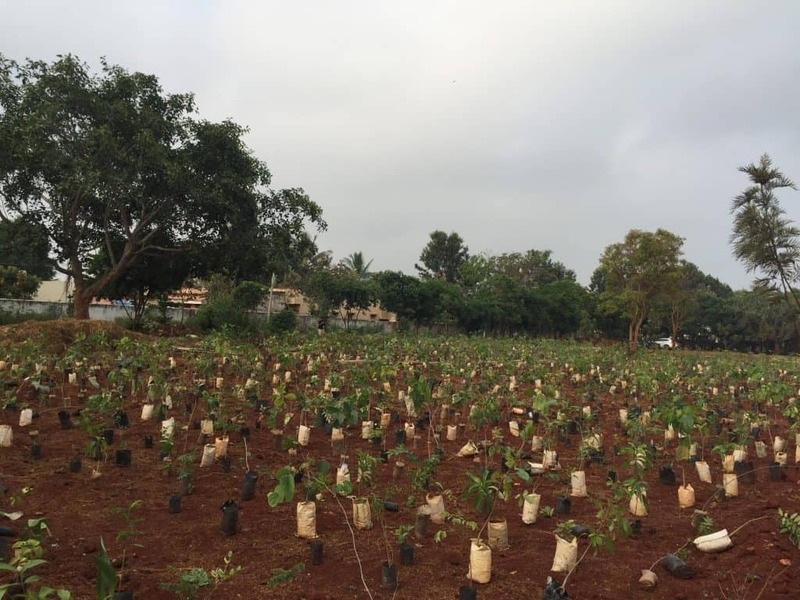 There were 96 varieties of saplings, including peepal, neem, banyan and other fruit-bearing ones, picked up from multiple nurseries around Bengaluru. In a year’s time, these saplings will grow to be dense, not leaving any space for people to even walk through it. 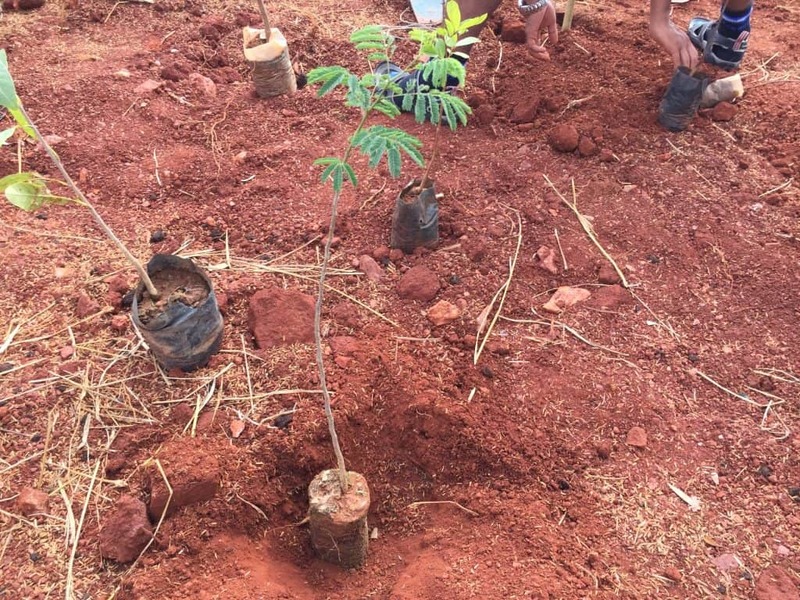 “Planting a variety of trees gives biodiversity to the environment,” adds a Say Trees member. This is what is looked like at the end of five hard working hours. Hay was added to the pit to keep water intact in the soil. 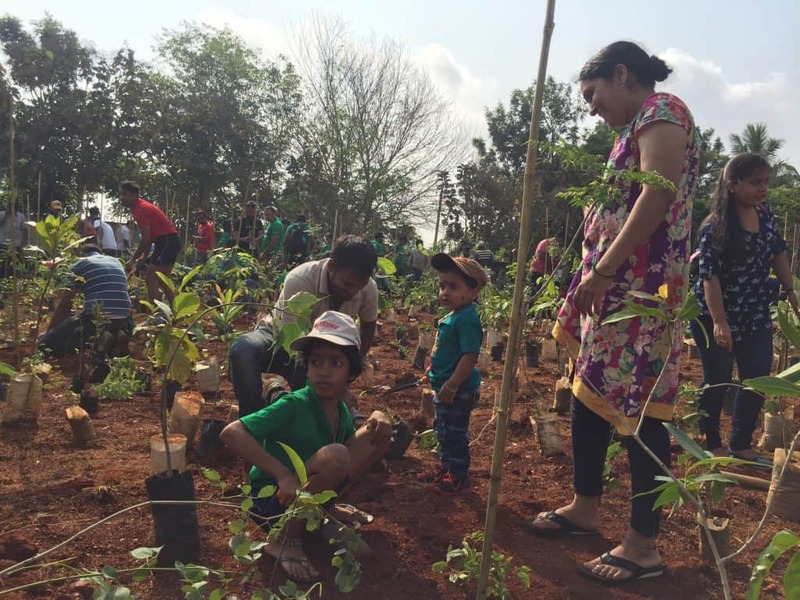 And around noon, the plantation drive came to an end with 5500 saplings successfully planted! 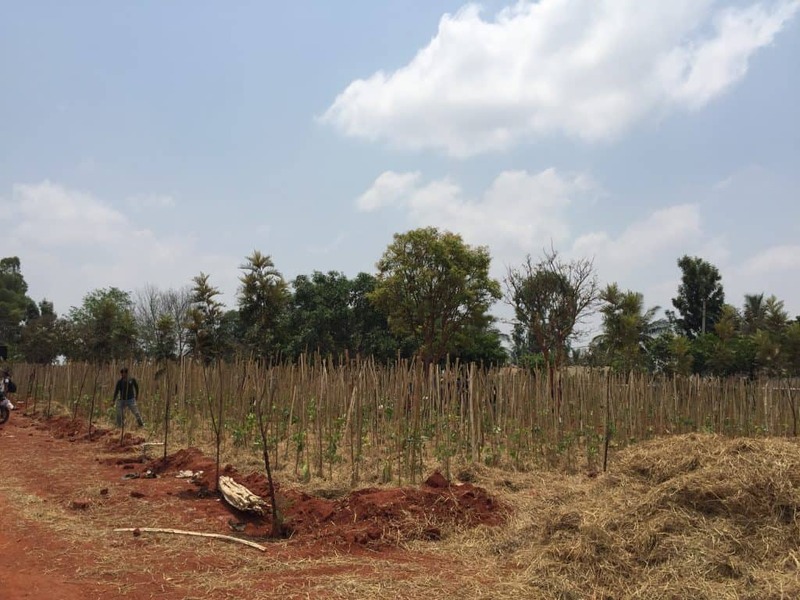 This is the first time ever the Miyawaki method of creating a forest was implemented in a school in Bengaluru. This government school plantation will have permanent manpower and sprinkler irrigation system for maintaining the forest for the next two years. Even if 92-93% of the saplings survive in the next 2-3 years, they would become self-sustainable with rainfall, ground water and water from sewage treatment plants for their nourishment. The organisers are yet to finalise from which sewage treatment plant water will be used. 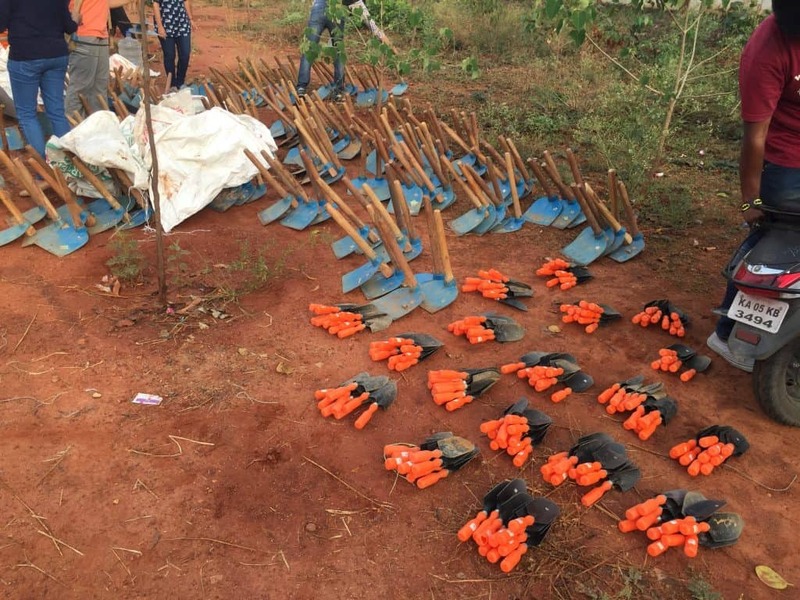 “Planting saplings is only a tip of the iceberg, maintenance is more important,” says Durgesh Aghari, Head of Partnerships and Projects at SayTrees. They plan to have a pond next to the forest pit where birds and small animals can come eat and find water to drink. The idea is to create a self-sustained space. Fidelity Investments whose many employees joined the effort funded this drive. Namita Iyengar, a Computer Science lecturer at Mahesh PU College, came for her first ever plantation drive. She arrived early morning to find the saplings lying around, and left with much joy after helping plant them all. “I plant trees in my house but coming and planting trees for the world, especially on Earth Day feels good,” says Namita. 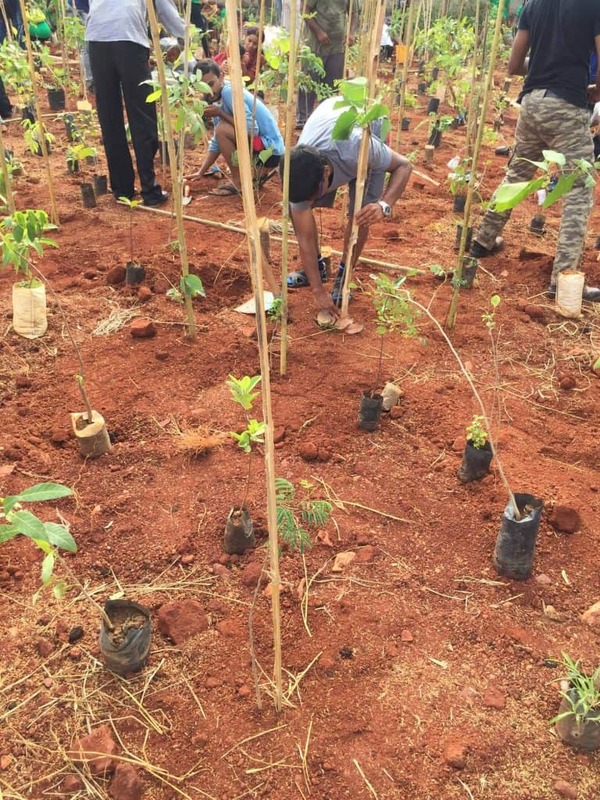 In last rainy season, Say Trees planted about 1 lakh trees. The survival rate, says Say Trees, has been 80-85% whereas around lakes it is over 90%. Plantations around lakes are safe as there is no threat from cattle, anti social elements, and local goons. Other areas such as railway land and open spaces have lower survival rates due to cattle movement and external human intervention. For example, a railway land near Yeshwantpur suffered 45% loss of saplings due to illegal dumping. 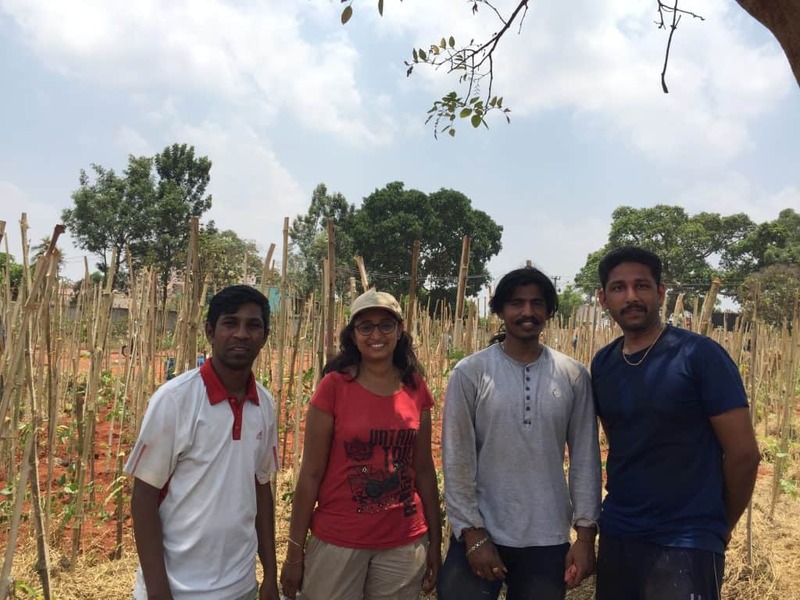 Another volunteer, Nagaraj Chilale, found out about SayTrees plantation drives a couple of months back and had been waiting for this day ever since. “Everybody was enthusiastic despite the harsh summer heat and committed to reaching the target,” he adds. At the end of five hours that hot summer morning, I left the government school feeling elated on being an active participant in improving my city’s green cover. 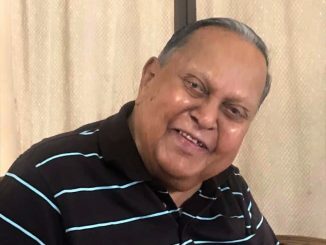 S R Neginhal, the pioneer of urban forestry who was tasked with greening Bengaluru once and did it successfully, talks about Bengaluru’s green cover and the way forward. i want to be a volunteer for future plantation program. please let me know how i will get notified for any volunteer work in bangalore.